Daim Miftari was born in 1979 in Gostivar, Macedonia. He holds a master’s degree in Albanian language and literature at Skopje University. Currently, he lives in the multilingual city of Skopje, where he has worked as journalist, translator, and teacher. A number of published books in both Albanian and Macedonian, as well as poetries translated and published in anthologies, newspapers and literary magazines in Macedonia and abroad, have earned him acclamation by the literary critics. 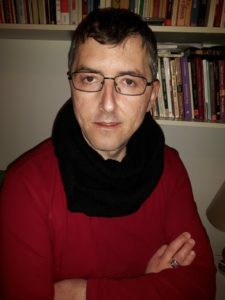 In April 2017 Daim Miftari was granted literary residence POETEKA in Tirana, Albania.